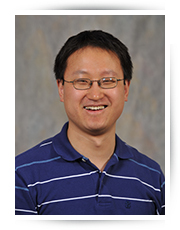 Prof. Yi Gu’s research interests are focused on the synthesis and characterizations of semiconductor nanostructures, including one-dimensional nanowires and two-dimensional atomically thin layers. Particularly, material synthesis is carried out using chemical vapor deposition to achieve a control of material dimensions and compositions. Using Raman spectroscopy and multi-functional scanning probe microscopy techniques, his group has been studying the structural phase transitions, carrier transport and dynamic properties in semiconductor nanostructures. The experimental efforts are complemented by finite-element simulations of material properties. 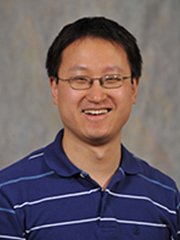 Prof. Gu conducted his PhD research at Columbia University (Applied Physics) on optical properties of semiconductor nanostructures, using primarily photoluminescence spectroscopy techniques. He then performed his post-doctoral research at Northwestern University (Materials Science and Engineering), studying the carrier transport properties in semiconductor nanowires. He joined the Department of Physics and Astronomy at Washington State University as an Assistant Professor in 2007, and was promoted to Associate Professor in 2013.